NEW YORK—War is a bloody business. So shows playwright Christopher Marlowe in his 1587 dramas “Tamburlaine, Parts I and II,” where the works are presented together at Theatre for a New Audience in a superlative theatrical offering. John Douglas Thompson gives an absolutely brilliant performance as the title character, a man who can basically be described as the god of war’s representative on Earth. It’s a title Tamburlaine continually lives up to, attacking city after city in campaigns of conquest across Egypt, Turkey, and other parts of North Africa and Central Asia. Before the play is over, the stage will be awash in blood and acts of barbarism committed at the drop of a hat, as loyalties repeatedly shift in an ongoing game of brinkmanship. Marlowe has created a fascinating character in Tamburlaine, a shepherd turned warrior. He is someone who can order the killing of virgins one moment and in the next show love and tenderness toward Zenocrate (Merritt Janson), the captured daughter of the Soldan of Egypt (Paul Lazar). Tamburlaine vows to make Zenocrate his bride. 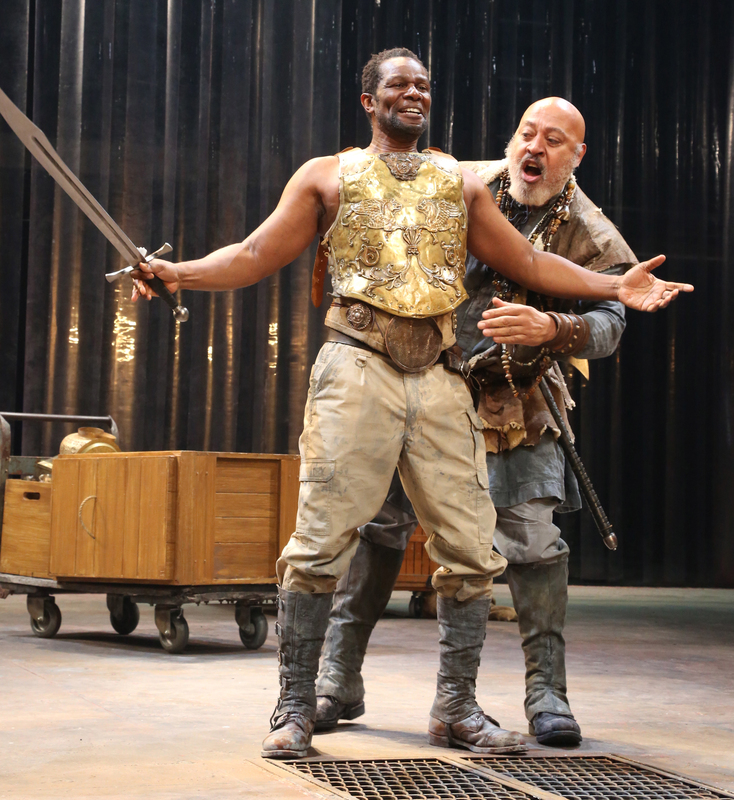 Tamburlaine alternates between brutal killer and almost likeable rogue with the ability to charm everyone he meets. This tactic is first demonstrated on Theridamus (Andrew Hovelson), commander of the Persian armies sent to intercept Tamburlaine. He instead joins forces with Tamburlaine, becoming his loyal follower. Loyalty is a quality Tamburlaine highly prizes. Tamburlaine is also an astute leader, preferring to lay siege to a city simply because it’s easier than taking it by force, but he’s certainly not averse to doing so. His patience quickly wears thin in these matters. 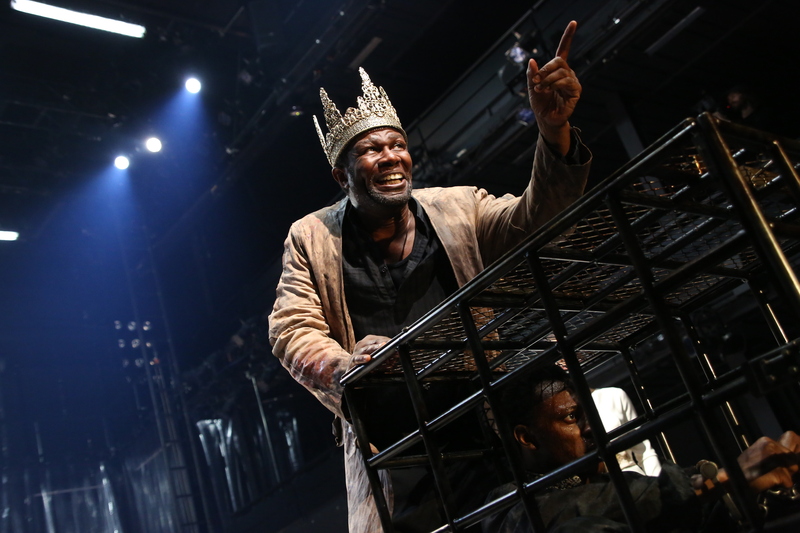 Thompson does a masterful job of making Tamburlaine appear a charismatic, ruthless, and fully three-dimensional individual. No matter how often Tamburlaine emerges triumphant, he knows there are always those who will escape his wrath and return to fight again. A particular highlight is the verbal duels between Tamburlaine and his opponents. A pivotal encounter occurs with the Turkish emperor Bajazeth (Chukwudi Iwuji). The two trade proclamations of defiance as they prepare for battle. At the same time Zenocrate, who by now has fully embraced her place at Tamburlaine’s side, trades barbs with Bajazeth’s queen, Zabina (Patrice Johnson Chevannes). The entire cast, many playing multiple roles, more than hold their own here. Janson leaves a lasting impression as Zenocrate. A rather realistic woman, one at first horrified by Tamburlaine’s actions, she soon becomes completely devoted to him, demonstrating her own eagerness for power as she shows how willing she is to be the bride of a conqueror. Her actual influence on Tamburlaine, though, is rather limited, as she learns when pleading for the lives of her father and friends. Iwuji and Chevannes are quite good as Bajazeth and Zabina, people full of pride and piety who, when captured by Tamburlaine, are forced to live as little better than slaves. The two survive only through their hatred for their captors and love for each other. Their later actions make them far more than the posturing figures they first appear to be. Lazar does a good turn as the rather inept King of Persia and the scheming jailer Almeda. Steven Skybell does quite well as Meander, a diplomatic type and consummate survivor who makes a habit of always being somewhere else when the fighting starts. Saxon Palmer is very good as Cosroe, the King of Persia’s brother who schemes to seize the throne for himself. He also strikes a convincing note as the King of Hungary, who must decide whether to keep his word to some newfound allies. The pros and cons of breaking an oath is a running theme in the play. 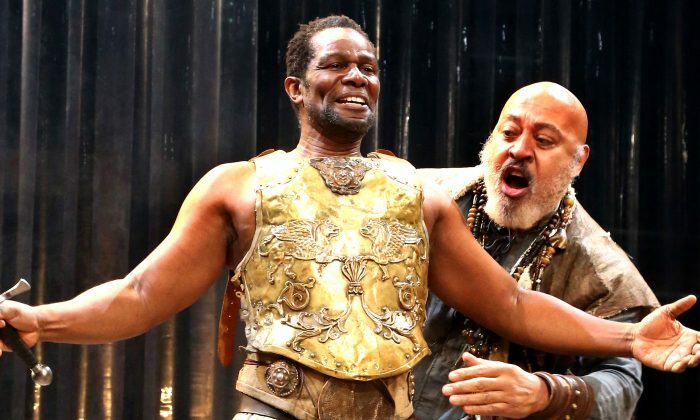 Other performances of note include Hovelson as Theridamus, Carlo Alban as Usumcasane, and Keith Randolph Smith as Techelles, the latter two longtime followers of Tamburlaine. They are all willing to divest themselves of the trappings of power Tamburlaine has bestowed just so they can reclaim them again after they show appropriate homage. The direction of the play is excellent, Michael Boyd doing a great job in fashioning the piece in a way that pulls the audience directly into the tale. His edits to the text also help to keep the action moving smoothly and the story focused. Credit must also go to choreographer Sam Pinkleton. The action takes place on a mostly bare stage, yet all of it is perfectly in keeping with the plot and never feels forced or repetitive, despite the continuous battles scenes. Also deserving of mention are the set and costumes by Tom Piper, sound design by Jane Shaw, and efforts of percussionist Arthur Solari, who handily delivers musical accompaniment when needed. 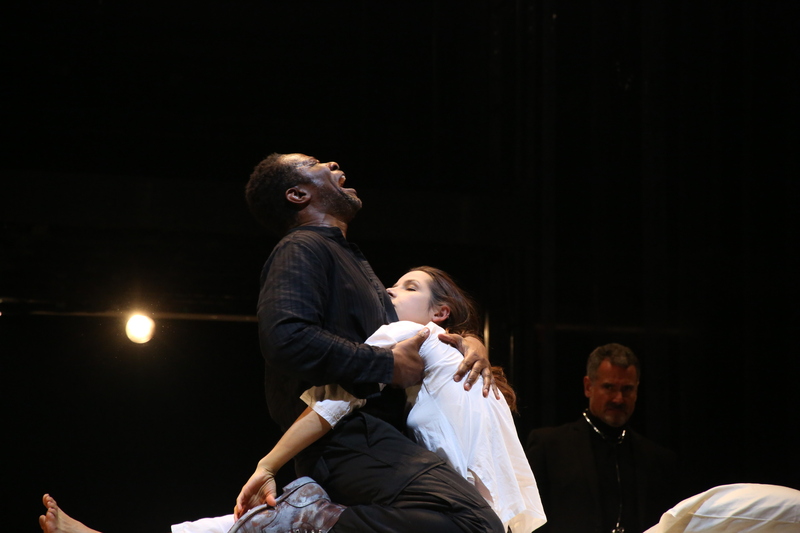 A griping tale showing a man without a conscience yet capable of great depths of feeling, Theatre for a New Audience’s “Tamburlaine, Parts I and II” is a masterful undertaking. Also in the cast are Tom O’Keefe, James Udom, Oberon K.A. Adjepong, Matthew Amendt, Vasile Flutur, Caroline Hewitt, Nilanjana Bose, Zachary Infante, and Ian Saint-Germain.